June 30, 2015 – San Francisco, CA – PipeLineNews.org – As outlined in a just published Institute for the Study of War [ISW] report, The Threat of New Al-Qaeda Leadership - Syria's Abu Mohammed Al-Joulani , the DC based think tank notes that the top rank of al-Qaeda’s upper level leadership is in a state of near constant flux, as important command individuals are either killed or become incapacitated. Such is the case with Nasir al-Wahayshi, who was KIA in Yemen sometime early in June. Outside of his duties in that country, Al-Qahayshi led al-Qaeda in the Arabian Peninsula [AQAP] with considerable success. The dynamic nature of al-Qaeda’s leadership presents a strategic choice for the group’s leader, Ayman al-Zawahiri. Though he could select AQAP’s new emir from the cadre of al-Qaeda’s long time elite, a more daring option has emerged which might prove more threatening to Western interests would be to advance younger potential generals who are already battle hardened and have proven themselves adept at field command. The study continues on pointing out that many in this second echelon bring other advantages, aside from proven effectiveness, to the equation. They already have established “extensive regional networks,” thus giving them a distinct advantage over the traditional core followers who are not as intimately familiar with current battlefield conditions. The event took place in Ireland at the “Whitewell Metropolitan Tabernacle Belfast” church, from which McConnell retired, at the age of 78, last year. The majority of the sermon was devoted to an explication of traditional Protestant theology, the centerpiece of which resounded with the theme, “for there is one God,” but early into the delivery the pastor entered a space where few public figures go, defining Islam as a heathen cult. McConnell intoned before a church filled to overflowing, that [paraphrasing], the God we worship tonight is the God of Abraham, Isaac and Jacob…the Father, he is not Allah. June 22, 2015 – San Francisco, CA – PipeLineNews.org – According to government statistics, jihadist activities pertaining to the West have dramatically increased recently. 1. There have been 24 ISIS-linked plots or attacks against Western targets in the first half of 2015, up from 19 in all of last year. 2. The number of homegrown terror plots since 9/11 has reached 116, tripling in just the past five years. 4. Foreign fighters continue to flow into Syria and Iraq. There has been an 80 percent increase in fighters traveling to the conflict zone since ISIS declared its “caliphate” one year ago. 5. More than 200 Americans are believed to have traveled - or attempted to travel - to fight in Syria, a 33 percent increase overall since the beginning of this year. This portrait, certainly not all inclusive, nonetheless indicates that jihadist movements are rapidly growing in numbers, complexity and confidence. June 22, 2015 – San Francisco, CA – PipeLineNews.org – Emerson Vermaat is a gifted Dutch researcher and author who has, over a long period of many years written a dozen books about the threat posed by the ideology of Islamic jihadism as well as providing analysis of topics dealing with the Third Reich. We consider ourselves lucky to serve as the publisher of his English language, feature journalism. Mr. Vermaat recently wrote a book on ISIS entitled, "Hatred Must Not Spill Over Into Our Streets-The Terror Threat Posed By Islamic State." What follows is a brief summary of the book [which as of this writing is only available in Dutch]. Back in 1996 the foreign editor of a current affairs program on Dutch TV directed me to make a shortened version of the British TV documentary Sudan – Are They Training Terrorists? This 40-minutes documentary, dated April 15, 1996, had been made by Journeyman Pictures in London. It was in this documentary that I came across Osama bin Laden’s name for the first time. The wealthy Saudi terrorist, described in Journeyman’s documentary as ‘a banker for jihad,’ was still in Sudan at the time, but Journeyman had been unable to interview him there. Other journalists would later be more successful. June 22, 2015 – San Francisco, CA – PipeLineNews.org – A recent article published by the Clarion Project [see, 'Iran Supporting More than 100 Shiite Terror Groups'] provides details gleaned from Egypt’s Al-Hayat newspaper, generally considered authoritative within an Arabic context, which believably alleges that Iran is engaged in a massive campaign of support of Shia terrorist groups. Iran has the deserved reputation of being the world’s leading source of terror funding, but this is the first time to our knowledge that a respected Middle East news source has provided this level of detail. We were recently party to a briefing by ex Director of Central Intelligence, in which Mr. Woolsey drew the same conclusion, however he expanded the indictment against the Ayatollocracy, mentioning that Iran is not only funding Islamic terror on a world-wide basis but that it already has effective control of 4 state capitols outside of its own borders. [see, James Woolsey’s Frontal Assault on Iranian Regime ]. June 18, 2015 – San Francisco, CA – PipeLineNews.org – General Martin Dempsey, Chair of O’s JCS appears to be the reincarnation of George B. McClellan, one of many Union generals who was always able to find an excuse not to fight, hence his being relieved from command by president Lincoln. "I would not recommend that we put U.S. forces in harm's way simply to stiffen the spine of local forces. If their spine is not stiffened by the threat of ISIL or their way of life, nothing we do is going to stiffen their spine." Dempsey even inferentially referring to “spine” or moral courage makes one retch. Carter Ham, who runs DOD, had much the same message, but we are inclined to give him a pass since he’s primarily a policy wonk and does what he’s told. If the generals and the CIC don’t want to kill people and break things then it would be silly to expect him to contradict those running the failed ME military strategy. "Enduring stability cannot be imposed from the outside in. Stability must be cultivated from the inside out." This clown and his boss simply aren’t playing it straight with America’s military and their families, let alone the nation upon whose existence it depends. The internal politics of Iraq, Syria, Iran and other failed-state hell holes no longer matters. What is of vital concern is the level of threat they present to the long term survival of the United States. June 16, 2015 – San Francisco, CA – PipeLineNews.org – We were recently honored to attend a briefing on the Iranian crisis delivered by R. James Woolsey, former Director of Central Intelligence [1993-1995] and current Chairman of the Foundation for the Defense of Democracies. Theocratic: Iran is a one party state led by a ruthless Shia religious figure [Ayatollah Ali Khamenei] with unlimited executive power and operating under a fundamentalist interpretation of the Shari’a. Part II - Why Is Anyone Still Listening to Maajid Nawaz? June 15, 2015 – San Francisco, CA – PipeLineNews.org – Maajid Nawaz - a British citizen - calls himself a Muslim reformer despite having had a very long history of Islamist activities, some of which were so serious that he was jailed for years in Egypt due to his recruiting efforts for a terrorist group. A flurry of activity a number of years ago first brought him to our attention. In the following period of time he became less publicly visible. Now, however he’s in the news again, having run [Liberal Democrat party] and lost a campaign for Parliament to represent North London. We first became aware of Mr. Nawaz and his MO a number of years ago, so let’s turn back the clock a few years. In a 2008 article Why Is Anyone Listening To Maajid Nawaz?, we characterized him rather harshly as an Islamist pretending to be moderate so he could cash in on the gravy train associated with the halal rubber-chicken lecture circuit which has grown up around the idea of promoting questionably “transformed” radical Muslims as spokesmen on behalf of “a kinder, gentler” Islam. That such activity also served to further cloak Nawaz’ Islamism wasn’t coincidental. Maajid Nawaz has recently been making the rounds on Capitol Hill, testifying before the Senate on matters concerning terrorism. He has been feted, in some circles; an iconic poster boy, this week's iteration of secular, non-political Islam. June 13, 2015 – San Francisco, CA – PipeLineNews.org – With the historically significant and strategically important Syrian city of Palmyra firmly in its grasp, ISIS has turned its efforts in the country towards taking Hasakeh, also considered vital to the regime. For two weeks now the city has been pounded by jihadist forces, elements of the Syrian army along with a few air strikes by the U.S. Despite claims made a week ago that the Syrian army had retaken the city, the evidence we have seen demonstrates that the area continues to be contested. “Under assault for almost a week, the strategic Syrian city of Al Hasakeh is in danger of falling to ISIS. The two most recent reports we have suggest that Assad’s troops are fleeing as ISIS fighters continue their push. June 10, 2015 – San Francisco, CA – PipeLineNews.org – The Tennessee based, Times Free Press, published a hit piece yesterday directed at Republican candidate for president, Senator Ted Cruz [R-TX]. It was written by one of the organization’s staff writers, Andy Sher, for whom we left two voice-mails, neither of which were returned as we go to press. “Our analysis begins with one of the most consequential [though little known] legal cases of this era, the landmark federal terror prosecution, "United States of America v. Holy Land Foundation For Relief And Development, et al," Case No. 3:04-CR-240-G, November 30, 2005. Also see 2004 DOJ announcement Holy Land Foundation Leaders, Accused of Providing Material Support to Hamas Terrorist Organization . June 9, 2015 – San Francisco, CA – PipeLineNews.org – The Iranian website Alalam is reporting today that ISIS as well as other jihadist groups such as Jabhat al-Nusra are using sophisticated American heavy weapons in the effort to establish a genuine Islamic caliphate headquartered in Iraq and Syria. How ISIS came to be in possession of these weapons is subject to debate. We absolutely know that Team Barry trans-shipped weapons from Benghazi, Libya directly to Syria and also through an intermediary country, Turkey to be delivered to this administration “moderate rebels” in Syria. Many of these were of Russian origin [man portable anti-aircraft missile defense weapons, MANPADS] testifying to Gaddafi’s long relationship with the Soviet Union. Others, of U.S. origin such as Stinger missiles were also part of this transfer process, since serial numbers have been matched against GI issue hardware. Regarding the heavy weapons; thought some might possibly have been shipped directly to Syria’s jihadists by the U.S., who then handed them over to ISIS, it's more likely that M198 howitzers and Abrams tanks were probably obtained directly by ISIS in any of the group’s numerous battlefield successes, left behind by fleeing Iraqi army troops. Alalam is a state controlled news source, owned by the Islamic Republic of Iran Broadcasting. Our enemies – both foreign and domestic – are resourceful. Fully realizing that they would be overmatched in a direct, military confrontation with Uncle Sam or for that matter Britain’s John Bull, those who seek to destroy us have adopted a strategy which has, to a greater degree than many realize, already proven successful. June 8, 2015 – San Francisco, CA – PipeLineNews.org - On June 4, 2015, Jason Walters said, “I just got word that my brother Jermaine had died in a bombardment.” Jermaine Walters is the brother of convicted Hofstadgroup member Jason Walters. (American father, Dutch mother.) The Hofstadgroup was a terrorist organization in the Netherlands. It was in prison that Jason gradually began to distance himself from the group. Jermaine himself was never sentenced to jail. Defense lawyers argued that he was a moderate Muslim. I never believed this. In September 2005 he said he would not be against blowing up the Dutch parliament with a bomb. At the end of August 2014, Jermaine, his wife Meryam and their three young children left the city of Amersfoort and traveled to Raqqa, the so-called capital of Syria’s most dangerous terror group ISIS. There, he was known as Abu Luqman Al-Muhajir. He repeatedly issued threats against his brother Jason because the latter broke completely with his former Hofstadgroup friends. June 5, 2015 – San Francisco, CA – PipeLineNews.org – Under assault for almost a week, the strategic Syrian city of Al Hasakeh, is in danger of falling to ISIS. The two most recent reports we have suggest that Assad’s troops are fleeing as ISIS fighters continue their push. Adam Pletts of News24 France states, “The Islamic state group has been able to enter the southern side of the city,” adding that residents are evacuating towards the north which is controlled by the YPG [Kurdish People’s Protection Units] which has made the decision not to formally engaged ISIS until it closes on their sector. 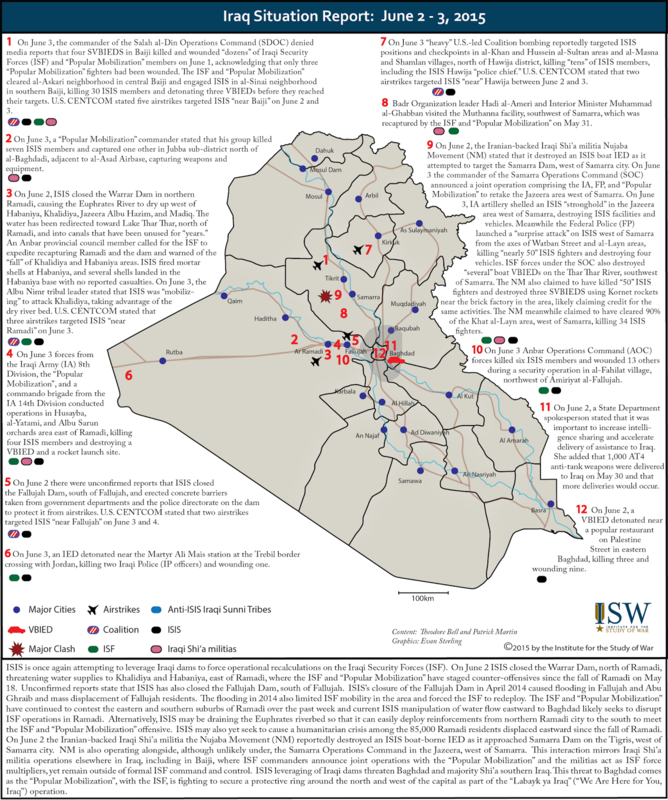 June 4, 2015 – San Francisco, CA – PipeLineNews.org – Drawing upon information provided in the latest sitrep by the Institute for the Study of War , and other sources, over the last 48 hours, ISIS has once more proven its resourcefulness, this time capturing control of the Warrar and Fallujah dams. Though the Iraqi government has announced that nearly a thousand of its “elite” fighters are being reassigned to deal with the crisis, the locals don’t seem all that impressed. Despite yesterday’s attempt by Team O to put a happy-face on the conflict, claiming without any means of verification, that the “coalition” air war has killed 10,000 members of ISIS, the above noted developments speak to the contrary, that rather than growing progressively weaker, ISIS continues to make wide inroads as it pushes the battle south east towards Baghdad against only limited resistance. June 3, 2015 – San Francisco, CA – PipeLineNews.org – We find the U.S. Supreme Court’s 8-1 recent decision [ U.S. EEOC vs. Abercrombie & Fitch Stores Inc.], to be very troubling. 1. It seeks to speak authoritatively based upon facts not in evidence, specifically regarding what constitute a “religious” obligation for Muslims. 2. It negligently expands employment discrimination law to the point where retailers have now apparently lost the ability to present the type of cohesive, positive corporate image the public has come to expect from high end merchandisers. It incorrectly applies the relevant legislative language regarding the matter and leaves retailers at increased risk for Islamist blackmail in the form of lawfare. However, there is no Qur’anic basis upon which to base a claim that wearing hijab is a religious requirement for Muslim women. The most relevant passage simply stresses a need for women to dress modestly. Thus wearing of hijab is at best a cultural affectation and can hardly be considered a requirement consistent with being a devout Muslim. Therefore Abercrombie appears to simply have been enforcing its “neutral look” policy which is religiously neutral in its reading and practice. The sole dissent was written by Justice Thomas, who quickly cut to the heart of the matter…the court was, once again, writing rather than interpreting law. June 1, 2015 – San Francisco, CA – PipeLineNews.org – The Center for Security Policy recently commissioned an opinion survey to be undertaken regarding American attitudes on matters pertaining to national security. The first release of these findings showed that a huge majority of the public opposes the proposed nuclear deal currently being negotiated between Team O and the world’s largest funder of terrorism, Iran. We find it a hopeful sign that more than half the population considers itself reasonably informed about the matter given its apparent indifference to much of what is coming out of the DC Beltway. June 1, 2015 – San Francisco, CA – PipeLineNews.org – Russian technicians have started construction on two new 1000MW nuke plants according to a report by Fars News. Rosatom State Atomic Energy Corporation is the government owned entity which will construct the reactors located in the Southern Iranian province of Bushehr. In addition to further solidifying the troubling nuclear relationship between Russia and Iran, the projects will generate over $10B in revenue for the cash strapped Russian economy.